Special Economic Zone Authority in Duqm (SEZAD) confirmed its commitment to protect the environment, preserve its natural components and pay attention to biodiversity in SEZD. Salim bin Yasser Al-Sulaimani, vice president of Support Services at SEZAD, indicated that the various elements of the environment are of interest to SEZAD given its main roles identified by the royal decrees. “Recently, SEZAD implemented many of the events and programs that aim to preserve the environmental health and safety,” added Al-Sulaimani in a speech at SEZAD celebration of the Omani Environment Day. During its celebration of the Omani Environment Day, SEZAD organized a number of events and activities that embodied the care enjoyed by the environment in SEZD IN cooperation with the companies operating there. The activities included an awareness seminar held at Crowne Plaza Hotel in Duqm under the auspices of Mohammed bin Saif Al-Topi, Director General of Regional Municipalities and Water Resources of Al-Wusta Region. It included several presentations and lectures aimed at raising the level of environmental awareness for all community groups, businesses and institutions operating in Duqm. The presenters confirmed the importance of reducing environmental pollutant rates and maintain the environmental health and safety, the fungal life and the marine environment. The events also included the implementation of beach cleaning in Duqm in cooperation between SEZAD and a number of companies operating in SEZD. 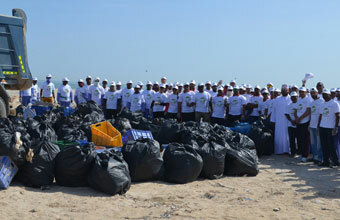 They provided 1150 municipal bags, three trucks the capacity of each is 10 tons of various waste and residues. Abdul Aziz Al Hinai CSR Specialist stated strongly that the responsibility to our Environment is not just alone the responsibility of the Government and Private sector, each and every one of us residing in this environment is responsible. 3 ten tonne trucks were filled, 1150 bin bags were used and over half a tonne of plastics and ropes were recovered. Oman is a beautiful country and more importantly Duqm has all the factors required to make it a tourist destination, if each one of us contributes within our society, together we can keep our environment clean and sustainable.